Capital High School senior, Payton McGuin, is called an inspiration by her teammates. Payton McGuin was surprised by the teammate’s compliment and didn’t know what to say. Her teammate had called her an inspiration. She’s a modest leader. McGuin and Lauren Pierson, Capital’s top two returning runners off a team that placed second in state last year, are the Cougars team captains. With that title comes responsibility. They can’t just be self-absorbed, focused only on their times. McGuin has reinvented herself as a runner since she first turned out for cross country as a sophomore. After growing up playing basketball, McGuin got her first taste of running her freshman year when she turned out for track. “I ran sprints,” McGuin said. On the advice of her coach, Kevin Wright, she ran a “distance” event – the 400 meters. 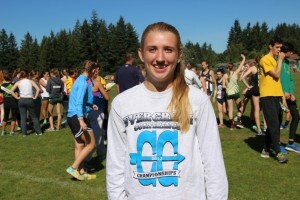 Showing promise – she ran it in 62 seconds – she showed up at cross country practice that fall. And she discovered that running, which is usually punishment in other sports when you do something wrong, was actually fun. Whether that’s in the classroom, where McGuin has a 3.7 GPA, or turning out for cross country or track, McGuin has a give-it-your-best-shot approach. That attitude is why McGuin knocked a minute off her time her sophomore year. And it’s why she’s grown into being Capital’s No. 2 runner this season. She was her team’s No. 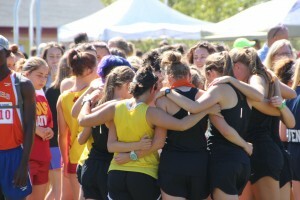 5 runner last year on a team that placed third in state for the second year in a row. 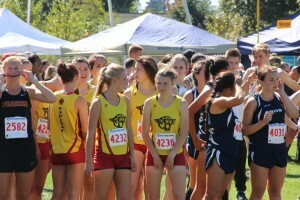 Cross country runners from Capital High School and Olympia High School join together before the Capital Invite race this month. By her junior year, McGuin had made a startling discovery. She could finish a race keeping a fast pace. But despite all her success, McGuin nearly didn’t turn out for cross country this season. That’s because her mother, Sheri, died of an illness in August at age 51. With some prodding by her coach and teammates, McGuin showed up for the first day of practice. She’s found being around friends, laughing and talking with them, working hard at a workout, pushing herself in practice, setting goals and trying to make it to state again to be good medicine. McGuin’s heart, her hard work at practice, her encouraging words to teammates, are even more inspirational for her teammates under the circumstances. While McGuin gets satisfaction from dropping her times, getting a personal best in a 3.2-mile race, it’s doesn’t trump the experience of being on a team. McGuin isn’t just the encourager. She’s also the encouraged. “If you’re having a bad race, there’s going to be somebody on the course cheering for you,” she said. Payton McGuin, wearing #4232, lines up at the starting line for the Capital Invite cross country race. McGuin and Pierson are the veteran returners for the Cougars. After finishing third last year at state as a team and after McGuin finished 25th, the expectations are big for this season as Capital has 18 runners returning and there are 40 turning out. But McGuin isn’t getting caught up with this having to be her best ever season. She’s not obsessed with dropping her times, and she’s not fretting about great expectations. At the recent Capital Invite, which drew 38 schools and an all-time high of 1,500 runners, McGuin and her teammates were on target. The Capital girls had a number of top 10 finishers. In the girls freshman race, Sarah Paquet placed 10th with a time of 15:37, just behind Olympia’s Ariel Wilhite, who placed ninth in 15:33. Mountain View’s Savanna Craig won in 14:05. In the girls senior race, Pierson finished fourth in 13:57, just 16 seconds out of first place. Henry Jackson’s Brooke Kingma won in 13:41. McGuin placed 11th with a time of 15:05. On the boys side, North Thurston’s Peter Allegre had the area’s fastest time as he placed second in the junior race with a time of 11:58. Olympia’s Kyle Rapacz placed third in the boys senior race with a time of 12:11 and teammate Ben Parke was sixth in 12:24. North Thurston’s Tyler Reece was seventh in 12:27. Northwest Christian’s Luke Schilter won the boys sophomore race in 12:03 and Tumwater’s Evan Groat finished fifth in 12:53.